In many environments, transcripts are a requirement, especially in educational and academic settings. In such scenarios, transcripts are documents which list out the score and grades of a student for a particular semester or an entire school year. 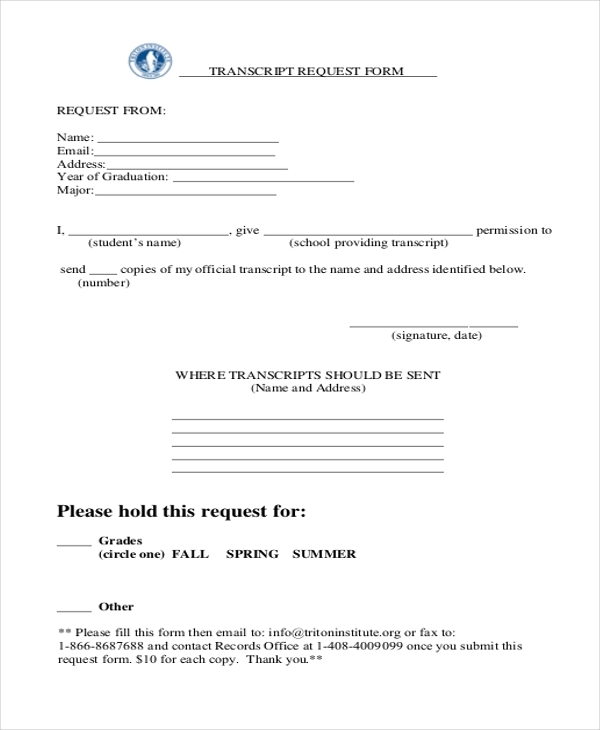 When a student applies to a college or university for graduation or post-graduation, he or she must submit original or copies of their transcripts. For this purpose, they must sometimes fill up and submit Request Forms to school or college authorities. 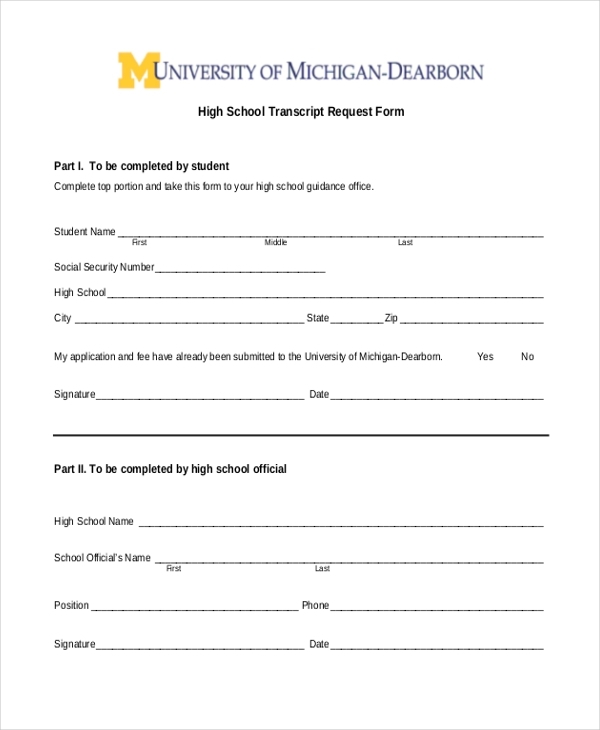 If a student is applying to college and needs to get hold of high school transcript, he or she needs to populate and submit a high school transcript request form. In this document, the fields in the first portion are supposed to be populated by the applicant, and the latter half is to be completed by the higher authorities. When a student applies for a course in college or university, it is routine for authorities to ask for the applicant’s high school transcript. A college transcript form needs to be defined by the applicant or their parent, the data needs to be forwarded or emailed at the concerned college address which is specified in the form. 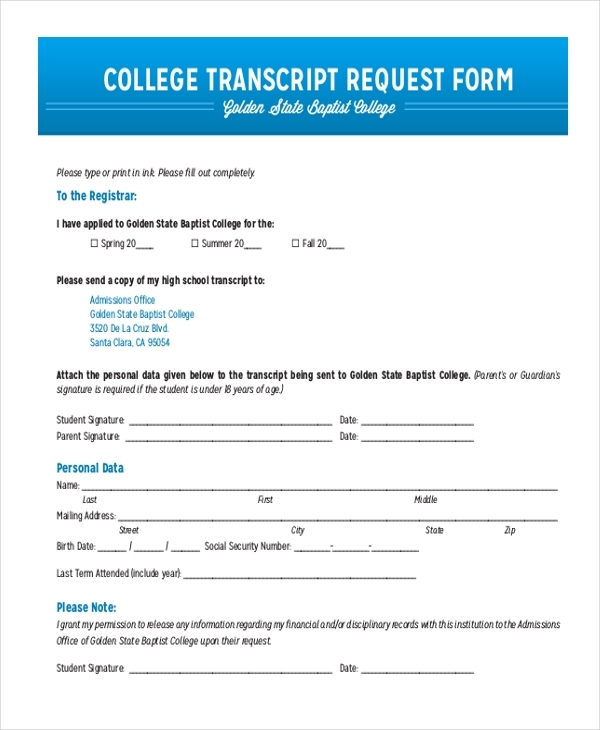 A generic transcript form is useful to colleges and universities when a new student wants to apply for his or her school or educational institute to submit transcripts copies to the college name and address mentioned in the following lines of the request form. Identity details of the applicant student along with signature must be specified accurately. If a student requires an official transcript of his or her scores from their university, the procedure entails that they apply for the same by means of an official transcript request form. An official transcript is made available to the applicant at a nominal fee which is charged by the university. In the case of many academic outlets and institutes, an online transcript request form is available on the official website. Applicants need to go to the university’s official website and download the transcript request form. Generate a print of the same and fill up the hard copy and submit to the authorities personally, or better populate the form online and email it directly. Academic transcript request forms are a norm which is usually carried out in colleges and universities and are mainly useful to new admissions. The document is an authorized paperwork which directs a university or school to release student transcript, grades, and credits to another specified college or academic outlet. 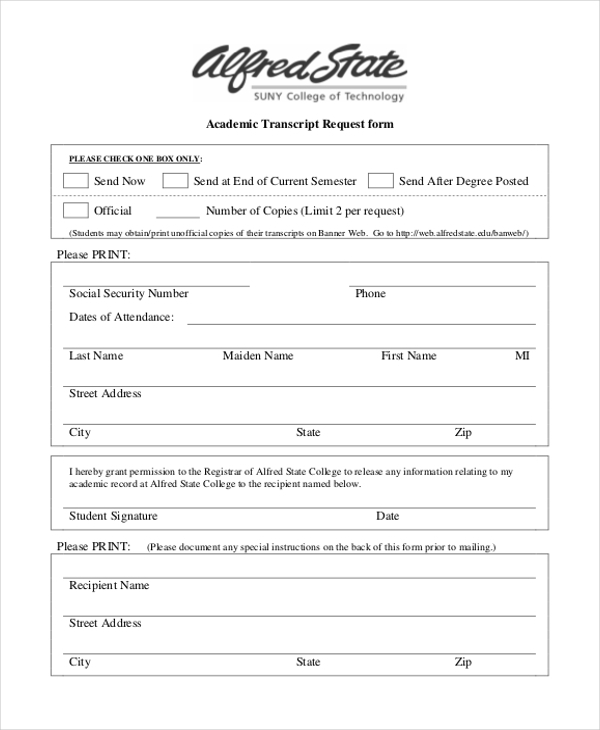 An academic transcript request form is handy for those students who need a source of the original transcript of their scores, grades, and other academic credentials. Such forms can also be used in cases wherein applicants want to or need to attest the original score sheets of specialized tests – SAT , TOEFL – which they may have appeared for earlier. A graduate transcript form is ideally useful to graduate students who need to submit their transcripts to the college wherein they have applied to join a post-graduate course. Accurate information needs to be defined in all fields listed. Why are Transcript Request Forms Important? In the eyes of many parents and students, the importance of transcripts is still underrated. Truth be told, without transcript request forms available, many people would be at a loss when it came to asking a university or school to share a student’s grades and credits with another educational institution where the applicant has applied to enroll in a course. Moreover, transcript request forms are also important for educational outlets because of these papers ensure there is a kind of pattern or discipline when parents and students approach them for their transcripts. 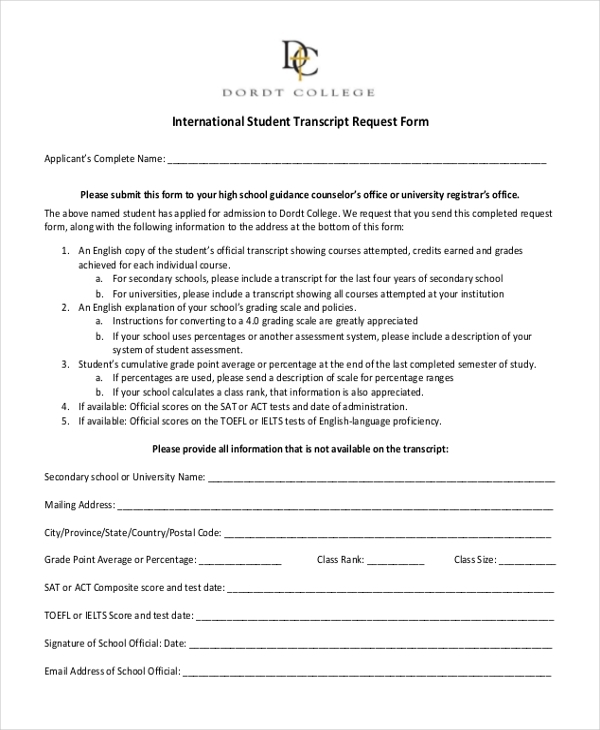 Where to get these Transcript Request Forms From? Luckily now we are in the era of the Internet and templates are more in vogue than ever before. If a university or student needs to design a transcript request form or to get an idea of what it looks like and its contents, there are abundant websites on the Internet which are happy to oblige needy users and let them download and customize readymade transcript request forms. The majority of the samples are free downloads, however, some web sources may ask a price. Popular form formats are MS Word, PSD, PDF and MS Excel. You may also see Vacation Request Forms. Why are Transcript Request Forms The Key? Believe it or not, among all the things which you will submit to the college or university admissions staff, your high school transcript, which contains your high school grades, classes, and GPA will most likely be the information which the admissions team will review with more interest. The reason for this is simple. Your transcript contains data regarding your coursework, grades, and overall performance. In order for the same to be supplied to the college or university of your choice, you have to place your faith in transcript request forms. Without them, it’s going to be an uphill task for any student or parent to have a transcript delivered in time. You can also see Donation Request Forms. There is no doubt that transcripts are important and so are transcript request forms. 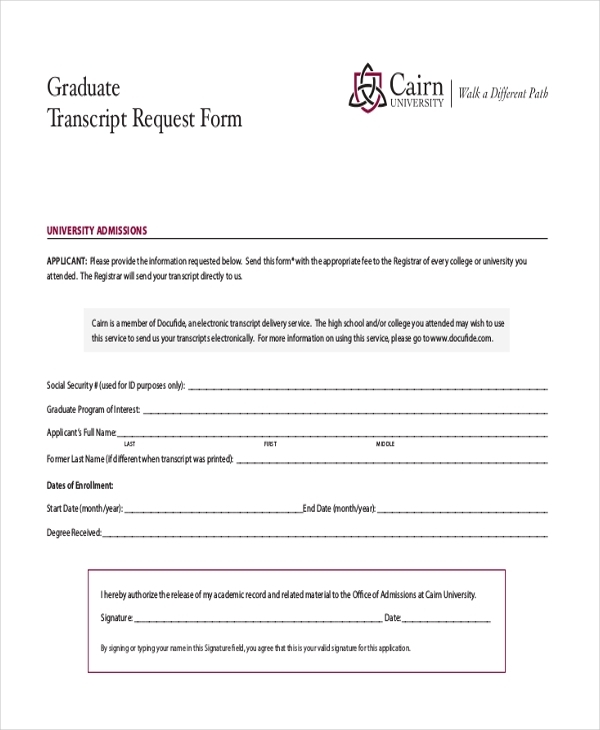 These type of request forms enable students and parents to have the confidence that academic vitals will be shared accurately and with due authorization.